Lighting Shabbat candles is a rabbinically mandated law in Judaism. 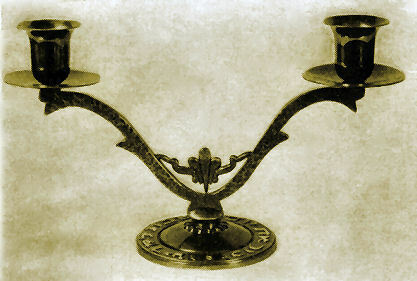 Two candles or more are lit on Friday evening, eighteen minutes before sundown, to welcome the Sabbath. Candlelighting is traditionally done by the woman of the household, though in the absence of a woman, it is done by a man. After lighting the candles, the woman waves her hands over them, covers her eyes, and recites a blessing. V'tzivanu l'hadlik neir shel shabbat. And has commanded us to light the Sabbath candles. This bronze example was designed by Maurice Ascalon and manufactured by his Pal-Bell Company in Israel in the 1940s. Shabbat or Shabbos is considered the day of rest in Judaism and symbolizes the seventh day in Genesis, after the six days of creation. It is observed from the sundown on Friday until the appearance of three stars in the sky on Saturday night. Thus, the exact time of Shabbat differs each week and from place to place, depending on the time of the sunset. Text and photos adapted from Wikipedia. Shabbat prayer transliteration and translation from www.myjewishlearning.com .